As you narrow your list of vacation places for this summer, you probably haven’t thought much about going to Arkansas. It’s not exactly high up on the list of tourist attractions, but that might be because you don’t know about any National parks in Arkansas. One of them is Hot Springs National Park. Not to be confused with Olympic National Park Hot Springs, or English Springs Park in California, Hot Springs offers a mix of architecture, history, and nature to keep everyone in your family entertained. Situated in the town of Hot Springs, Arkansas, it is a unique national park because it is a mix of wilderness and urban area. It has the best qualities of both a town and a park. The town was built-up around the natural hot springs, and it has been a tourist attraction ever since. It boasts some of the cleanest, purest water in the country, and when you visit, you are never far from the sound of fresh running water. You can easily split your time between the park’s wilderness, and the historic downtown of Hot Springs. You can walk on the Grand Promenade for a view of the downtown. You can bask in the small town charm of the little city, but you can still find time to commune with nature. Still not convinced that Arkansas can pep up your summer vacation? Check out these three ways you can get to know the park, and find something fun for everyone in your family. Bathhouses represent a unique slice of American medical and recreational history. 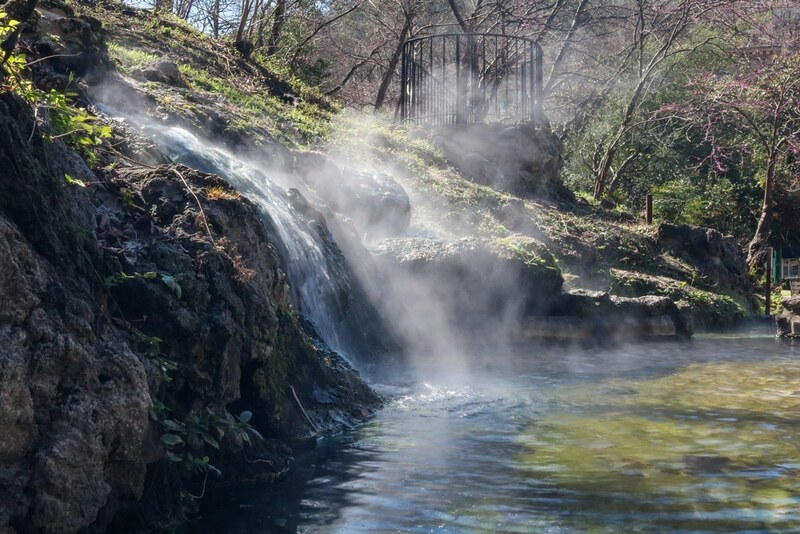 They were designed and built in the late nineteenth and early twentieth centuries, and marketed as places that could harness the healing powers of the natural springs. They were also places where the well-to-do came to bathe in the lap of luxury. They are not so different from modern spas, but with perhaps a slightly more medicinal approach. Bathhouse Row in downtown Hot Springs offers you a way to stroll through history. You can explore and admire the eight historic bathhouses that line the street. The houses were built between 1892 and 1923, and many of them have been renovated since. Each house is unique, ornate, and an architectural marvel. The Fordyce Bathhouse is the most elaborate and expensive bathhouse on the row, and it now serves as a museum and visitor center. You can stop in to gather information about your stay, and you can explore the furnished rooms that offer a window into an almost forgotten past. No visit to Hot Springs is complete without an authentic bathhouse experience. Luckily, the Buckstaff is still operational. It is the only bathhouse on the row that is still a functional bathhouse, and it offers a wide array of services. You can opt for the traditional bath, or you can upgrade to something more modern. You can tap into the power of the hot springs mineral water, and you can see for yourself whether it has unique healing powers or not. And if the mineral water doesn’t relieve your stress, the Swedish massages they offer surely will. To make the most of your visit, save this spot for after a long day of hiking. As you plan your trip you will often hear words like stroll, amble, and maybe even mosey. That’s because the trails that crisscross the park are perfect for a leisurely walk. While other parks require lots of equipment, preparation, and hiking experience, the trails at Hot Springs are suited for a variety of ages and abilities. That’s part of what makes it a great family destination. You can get your kids out enjoying nature, without feeling like you’ve put them on a forced march. Numerous campgrounds make Hot Springs National Park camping fun, easy, and affordable. There are abundant picnic grounds, and plenty of chances for good old-fashioned family bonding. Unlike most national parks, Hot Springs National Park is not nestled in a remote corner of the desert, or isolated forest. In fact, it’s adjacent to an urban area. Often when you plan a vacation you limit yourself to one kind of adventure. You either opt for the history and culture of a city, or the pristine peace of nature. Hot Springs makes it so that you don’t have to choose, and you don’t have to waste time shuttling hours back and forth between attractions. Hot Springs is a surprisingly bustling little burgh full of independent eateries, coffee shops, museums, and festivals. Start your morning off at Will’s Cinnamon Shop for a decadent cinnamon roll made from scratch, amble past the architecture of Bathhouse Row, and then take a trip Garvan Woodland Gardens. You can spend the afternoon strolling through the botanical garden, and when you’ve had your fill of nature, you can make your way to the spa. Hot Springs, Arkansas is a hidden little gem. It has culture, history, and nature. It has everything your family is looking for, and now you know all about it.